Record the listed restriction by the corresponding letter or code indicated on license. 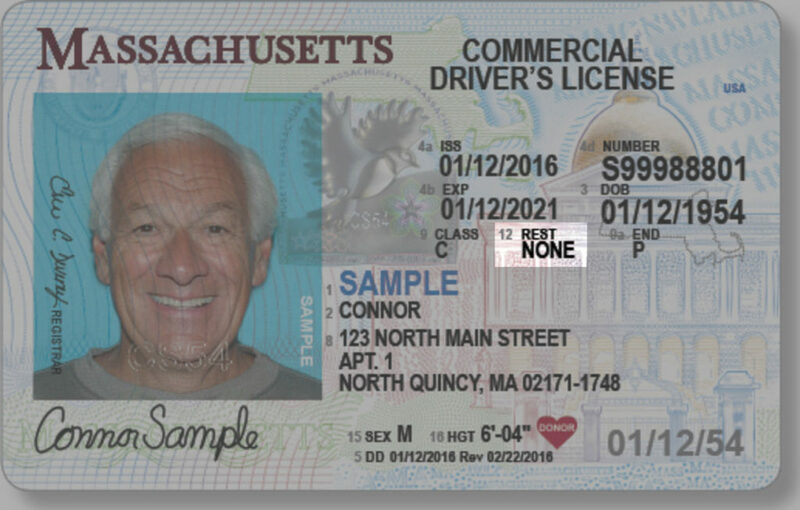 Restrictions assigned to an individual’s driver license by the license examiner. This element is used for identifying whether a driver involved in the crash has limitations on their driver license. B Corrective Lenses This restriction is required when the driver uses glasses, contact lenses, or bioptic telescopic lenses to operate a motor vehicle. C Mechanical Aid This restriction is required when the driver needs a mechanical aid (such as hand controls, spinner knob, parabolic mirror, directional extender, etc.) to operate a motor vehicle. It must be added if so directed by a medical professional or Registry of Motor Vehicles Road Test Examiner. This restriction applies to all permit/license classes. D Prosthetic Aid / Personal Medical Aid This restriction is required when the driver must wear a prosthetic aid. It must be added if so directed by a medical professional or Registry of Motor Vehicles Road Test Examiner. This restriction applies to all permit/license classes. E CMV Automatic Transmission If the driver takes the Skills Test in a vehicle that has an automatic transmission, then an “E” no manual transmission restriction is placed on their license. F Outside Mirror This restriction is required when so directed by a medical professional or a Registry of Motor Vehicles Road Test Examiner. This restriction applies to all permit/license classes. G Daylight Only This restriction is required when the driver passes the vision screening test with between 20/50 – 20/70 distant visual acuity in either eye, with or without corrective lenses, and meets the horizontal peripheral field of vision standards, with not less than 120 degrees combined horizontal peripheral field of vision. This restriction applies to a Class D or Class M permit/license, or a Class D/M license only. A Commercial Driver’s License should be downgraded if this restriction is applicable. I JOL Limited / Other This attribute is used for a variable that is not addressed by the previous attribute options. If this attribute is used, an explanation in the narrative is recommended. L CDL – Vehicles without Airbrakes If the driver does not pass the Air Brakes Knowledge Test, does not correctly identify the air brake system components, does not properly conduct an air brake systems check, or does not take the Skills test in a vehicle with a full air brake system, the driver must have an “L” no full air brake restriction placed on their license. M CDL – Except Class A Bus If a driver possesses a class A CDL, but obtains his or her passenger or school bus endorsement in a Class B vehicle the State must place an “M” restriction indicating that the driver can only operate Class B and C passenger vehicle or school buses. N CDL – Except Class A & B Bus If a driver possesses a Class B CDL, but obtains his or her passenger or school bus endorsement in a Class C vehicle; the State must place an “N” restriction indicating that the driver can only operate Class C passenger vehicles or school buses. O CDL – Except Tractor / Trailer If the driver takes the Skills Test in a Class A vehicle that has a pintle hook or other non-fifth wheel connection, they will have an “O” restriction placed on their license restricting them from driving any Class A vehicle with a fifth wheel connection. R Bioptic Telescoping Lens This restriction is required when the driver must wear eyeglasses with a bioptic telescopic lens when operating a motor vehicle. This restriction applies to Class D permits/licenses only. S Proof of Blood Sugar Level This restriction is required when the customer must carry a glucose monitor, check blood sugar prior to driving, and have proof of blood sugar check (e.g. the log from a blood glucose meter) if requested by a law enforcement official. It must be added if so directed by a medical professional and the restriction is maintained by the Medical Affairs. This restriction applies to all permit/license classes. A Commercial Driver’s License will also have a W restriction or V restriction added. T Ignition Interlock An ignition interlock device or breath alcohol ignition interlock device is a breathalyzer for an individual’s vehicle. It requires the driver to blow into a mouthpiece on the device before starting the vehicle. V Medical Variance If the State is notified by the FMCSA that a medical variance has been issued to the driver, the State must indicate the existence of such a medical variance on the CDLIS driving record and the CDL document using a restriction code “V” to indicate that there is information about the medical variance on the CDLIS record. Z CDL – Air Over Hydraulic If the driver takes the test in a vehicle with an air over hydraulic brake system, then they will have a “Z” no full air brake restriction placed on their license. In either case the driver is not authorized to operate a CMV equipped with full air brakes. What should be entered when no restrictions are found on the license? Leave this field empty if not applicable.